Dubai: Today is a day many have been anticipating and for one man it is the first day of a gruelling week. Scott Ragsdale, set off on his naseba-seven challenge early this morning in Fujairah on day one of his seven-day quest. He began in spite of a groin injury resulting from a bicycle accident earlier this month. This has shaken his confidence in his ability to make it through this week. "I don't doubt the fact I'm physically in shape to do this," he told Gulf News days before his challenge. "I'm just concerned my leg is not going to physically hold up." For the next week, Ragsdale will swim 3.86 kilometres, cycle 180.25 kilometres and run 42.195 kilometres across the seven Emirates. Endorsed by the General Authority of Youth and Sports Welfare, Ragsdale's challenge comes as a celebration of his 40th birthday which coincides with the 40th National Day next month. "There were a couple of weeks where I didn't train at all…but for me it's more mental on getting my head focused on not thinking about the pain," he said. Although Ragsdale's confidence may have waned slightly, the medics remain confident. Orthopedic surgeon, Dr Yousuf Fallaha, treated Ragsdale for torn cartilage in both his knees in January and has been treating him for his most recent injury. "Unfortunately, he had a nasty fall and bruised his groin muscle," said Dr Fallaha. "Until he had the bike accident I was 100 per cent sure he'd make it." He said Ragsdale might need strong pain medication. "But with his ego and mentality I'm pretty sure he will be able to do it," the doctor added. There was a moment when, Ragsdale had seriously considered postponing the race in order to heal but decided against it. "I considered postponing until the beginning of January, but it will ruin my family's Christmas and all the preparation I've done for this," he said. However, for his wife, Sophie Leray Ragsdale the build up to today's challenge has been life changing. She said the experience has motivated the family, "but it's been challenging because it's not always fun to be around someone who's going through constant ups and downs". 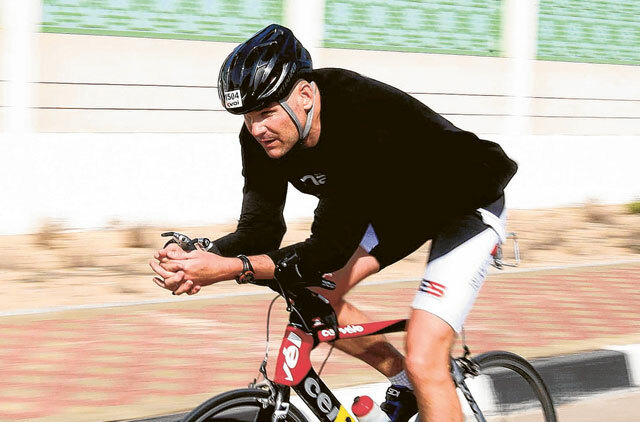 This morning Scott Ragsdale set off on a seven-day consecutive Ironman Triathlon. He started in Fujairah and will move on to Ras Al Khaimah; Umm Al Quwain; Ajman; Sharjah; Dubai to finish at Abu Dhabi's Emirates Palace Hotel on Wednesday. The Ironman Triathlon is organised by the World Triathlon Corporation. The challenge must be completed without a break and has a time limit of 17 hours for completion. Scott Ragsdale aims to complete it in 14 hours or less.